As the guarantee states “Every item we sell will give you complete satisfaction or you may return it for a full refund” You can follow one of our three simple ways to return. Complete the exchange portion on the back of the Order Summary form and include it with your returned item. We will send the new item out to you and we will pay for the shipping. To receive your exchange item even faster, simply place your new order at 1-800-426-8020. We will charge you for the purchase price of your exchange and will waive shipping. Once your return is received we will credit you for the cost of the original item. Items exchanged without a receipt will be based on current value of the item. We will issue refunds using the same method as the original payment. Returns without a receipt or items purchased with e-gift cards, gift receipts and award certificates, will be refunded as merchandise credit. Please note all sales from our warehouse stores are final. Items purchased using PayPal may be returned by mail to receive credit to a PayPal account. PayPal purchases may also be returned to a store and the refund will be applied to the customer’s credit card. Unfortunately, we are unable to process exchange requests from PayPal returns by mail. Please visit our website or call us at 1-800-426-8020 and we’ll be happy to help you place a new order. All custom items are guaranteed against any shipping damage or manufacturing defects. They cannot, however, be returned for any reason, including color and/or monogram choices, or incorrect size selection. We’ll gladly issue a refund in the original form of payment if you are not completely satisfied with your purchase. Exchange or merchandise credit. 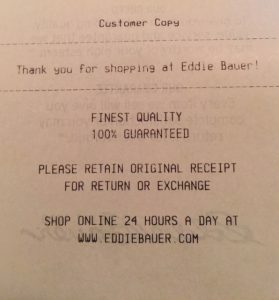 A merchandise credit can be applied to any Eddie Bauer purchase in our stores, on the website or over the phone. Exchange or merchandise credit based on current value of item. Catalog and Internet returns and exchanges can be made to our Canadian stores however duty charges will be forfeited. 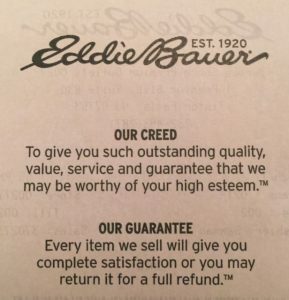 Duty can only be reimbursed when product is returned to Eddie Bauer in the United States. To receive a credit including all duties and taxes, see our instructions for International returns by mail. Use the prepaid label on the front of the order summary included with your order. Just drop the package in the mail, give it to your postal carrier or take it to the Post Office. If a prepaid label was not provided on the front of your order summary, please follow the “Return on your own” instructions. When using the prepaid label you pay nothing up front. Instead, a return shipping charge of $6.00 will be deducted from your merchandise credit or refund for returns weighing 5 pounds or less and $8.50 for all other packages. If you purchased during a “Free Returns” promotion and your purchase met the stated requirements, use the Smart Label to return qualifying items and no deduction will be taken. Please allow about 14 days for us to receive and process your return or exchange. We’ll credit or refund the value of the merchandise total and any taxes you were charged (excluding delivery charges), less the prepaid label return charge. Insure the package for the full value of the merchandise being returned. Keep your shipping receipt until the credit for your return has processed. Please allow a minimum of 14 days for us to receive and process your return or exchange. We’ll credit or refund the value of the merchandise total and any taxes you were charged (excluding delivery charges). International customers, please see our separate instructions for International returns to receive a refund including all duties and taxes. Borderfree will credit your return once the package is received, typically within 14-30 business days after you send it. If you have any further questions, please emailCustomerService@service.eddiebauer.com or call us at 1-800-848-4910.